I am now 16 months out from my first D-Day, 9 months from my last, and if there is one word that can describe the spot I seem to circle when the chutes open underneath me, it's "disorienting". I understand what happened. My wife is doing the hard work of self-discovery: linking childhood abuses to her adulterous behavior, showing empathy and remorse, leading classes, and attending volumes of counseling. I have grown from someone who was convinced that I had never met a shrink who didn't need one, to the guy craving his next individual session. However, even amongst all this work and progress, I often circle back to an empty feeling. How could I have been so wrong about who she was? The day before my first D-day I would've sworn there was absolutely no way on earth she would have ever been unfaithful at any time in our 23+year relationship. But she was deep in her 4th affair . . . Despite having committed myself to my own healing journey, there have been many personal slips along the way. I have turned to old habits of rage, excessive slips with alcohol, intentionally isolating myself, and trying to ignore my reality. In each case, the emptiness just lingers. When I'm in the hole of darkness, it is hard to remember what it felt like not to be, even if that was only a few hours ago. Funny thing is, when I'm not in it, I often do not stop to enjoy the peace of contentment. The more I grow in my own journey of self-discovery, the more I begin to see my situation from a higher level - the forest for the trees. I have learned that when I can only see the trunks of the trees and only focus on an unanswerable question or two, then I am in a space that is simply irrational. I am only passing through this space and, in time, it will end as it always has. As elementary as the words are, it has taken me this long to truly comprehend that every feeling has a beginning, middle, and end. If the feeling is dark, then I have hope that the end of the darkness draws closer with each second. If it is good, then an awareness that I should enjoy and experience it helps extend the peace. I am told the pros call this "mindfulness". In layman's verbage, I'd say it's simply getting my head out of my rear. Regardless of how sophisticated you would like to be in your interpretation, I think we can all benefit by regular reminders to have a little grace on yourself and do what you can to stay in this moment and out of the past. For me, these efforts at self-care have reignited an old passion with bird hunting and all things hunting dogs. Dare I say I have even discovered that some simple childhood pleasures like peanut butter and junk food shouldn't be ignored. Yes, even at 47 years old, puppies and ice cream can work wonders. Find your way out of the hole, make the effort to realize what works for you, and make it routine. Although the specific resource may be personal, the need for it is universal in this journey we have been thrown into. My hope is that each time I climb out of the hole, a little dirt falls back in it, and next time it will not be as deep. Each time I climb out I am reminded again that God's grace in my life is overwhelming. Even this dark betrayal didn't destroy my thriving law practice, beautiful children, and a wife willing to face her demons. I am still uncertain how this will end for me, but perhaps that is the greatest lesson I can take from all this: the ability to accept I do not have to know tomorrow, as He's got me today. Thank you for sharing your wisdom and encouragement. I appreciate your courage to write and look forward to reading more. Love the newfound love of bird dogs and ice cream. When my betrayed husband got a bird dog puppy after a while in our recovery it was the first time I had seen a genuine smile in months. Gods creation is good and healing. I appreciate the kind words of support. I look forward to the opportunity to share more soon. Thanks for this. I have a feeling your introduction to this group will be very helpful. While I may be years ahead in experience I'm way behind in true recovery from the trauma. Your voice is eloquent and very helpful. Thanks again! Thank you for articulating this so well. Your post has so many important and necessary reminders for me that I will print it and read it often. It seems so easy sometimes to get caught up in an intrusive thought and find yourself down a ridiculous rabbit hole that is only hurting you more. When my IC talks about mindfulness it always seems easier said than done, but when you explain it in more practical terms it feels like something I can achieve. Thank you and here’s to healing:). All of the therapeutic concepts I now contemplate constantly were completely foreign to me prior to d-day (mindfulness, co-dependence, ptsd, etc.). I am definitely one that needs things broken down into practical, simple, and tangible steps in order for it to really soak in. I am glad this one helped. Your words mean a lot to me as well. More to come. I am so thankful that you are sharing. It so nice to hear from the betrayed. There is a lot on here from those who betrayed but not the ones who were betrayed and I appreciate what you said so much. I can relate to it. I appreciate greatly your support and agree, we need more betrayed, and men, sharing. I read this a month ago and it was good to read it again today. I enjoyed your analogy of the hole slowly filling up with a bit of dirt every time and eventually not being so deep. I pray this will be true for my husband and every betrayed spouse. It's hard from the outside to understand how deep the hole is but I know it can seem impossible to get out in the darkest moments. I hope you will grace us with more blogs. Your efforts are very much appreciated. I too am a betrayed spouse. So much of what you say rings true. I too would have sworn, and would have bet any amount the day before D-Day that my spouse would never have an affair. It just wasn't her - or us. We were different I thought. I thought we both did. Now it's almost eight months post D-day number one and she has has decided to leave. Every day, sometimes many times a day I feel the chutes open under me into the emptiness of despair. Every day I agonize: How could I have not seen who she was? Hoow did I miss this? 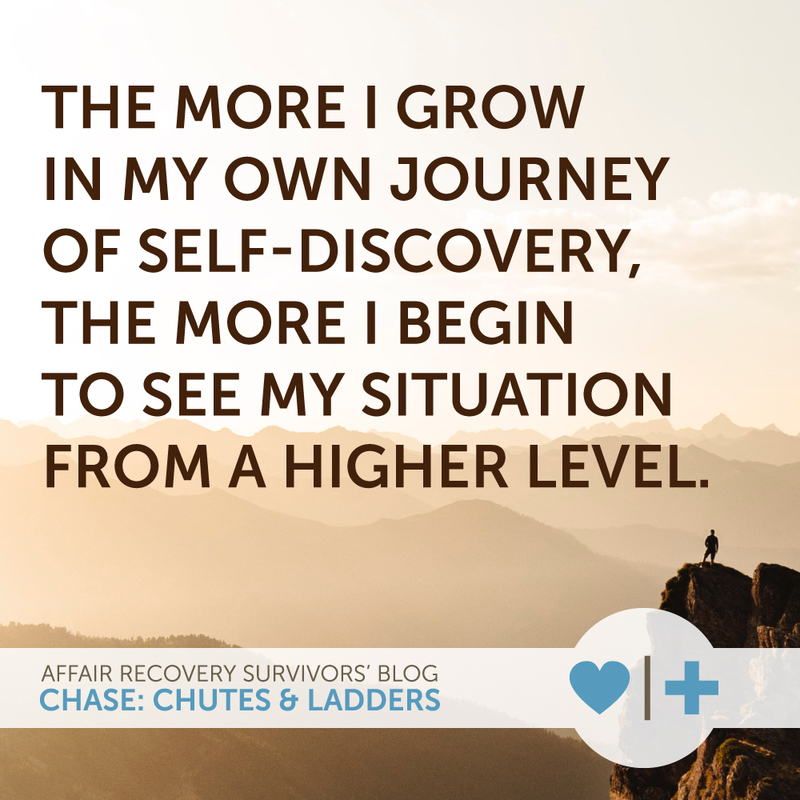 Every time I start to feel a little better, ever time I lose myself in a task, every time I begin to feel a little joy, I fall down another chute, and the pain returns. I'm going to hang on to your forest and trees analogy. I'm going to try to be mindful: If I'm seeing too many tree trunks too often, too persistently, that it is not a rational space, and that I will pass through it. Yes, Chase explains the situation so well. I'm so sorry 1dp to hear about your wife leaving after HER betrayal of you. It is great to hear stories about remorseful spouses who regret what they have done and do all they can to bring healing to the betrayed. Elizabeth on this site is very insightful, and Chase and his perspective is encouraging. But as a betrayed spouse myself, whose wife has chosen to leave after HER affair, even as I had been willing to work with her in recovery, has been heart-breaking and emotionally exhausting. We started in marriage counseling until I discovered her emotional affair at the 6th month mark. We then did individual counseling for two years, with joint sessions occasionally during that time. I also sought counsel from a clinical psychologist to work on myself. All of this to arrive at the conclusion that I contributed to our marriage disfunction, but that all I had contol of in the process is myself. I could not make my wife become sorry for what she did. In fact, she blamed me instead of owning up to HER selfish choices. Now there was, eventually, an apology, asking for forgiveness. But there was never a desire in her to repair, to take full responsibility for the affair so that we could move on to work through recovery. We divorced at the beginning of this year, and are stumbling through caring for our 3 children, splitting time with them as everything else was split. We were married for nearly 20 years. So sad. Sorry for the long backstory but I wanted you to know I understand your pain. It is supremely unfair, so painful if you have young kids too. But if you are not in individual counseling and/or taking advantage of AR's resources, please do. I'm seeing that healing alone takes much courage. I'm working to unwire any feelings of being a victim, of being bitter, of shame, of unforgiveness. The Bible, in Ephesians 4:31-32, talks about getting rid of those. Let go of what you don't have control of, and pick up what you are in control of - you. Do have grace on yourself, but in time, look to use this painful time as a catalyst for you. I don't believe God wants us to waste our painful circumstances, as unfair as they seem. Perhaps our situations are under-represented on a site geared to marriage recovery. Totally understandable. AR does have programs for healing alone that look helpful. I just saw your comment and wanted to give you some perspective that I hope is helpful. I feel for you, but I believe the future holds hope. I have found asking God for help, crying out to Him, helps me move forward, day by day. Please take care of yourself.